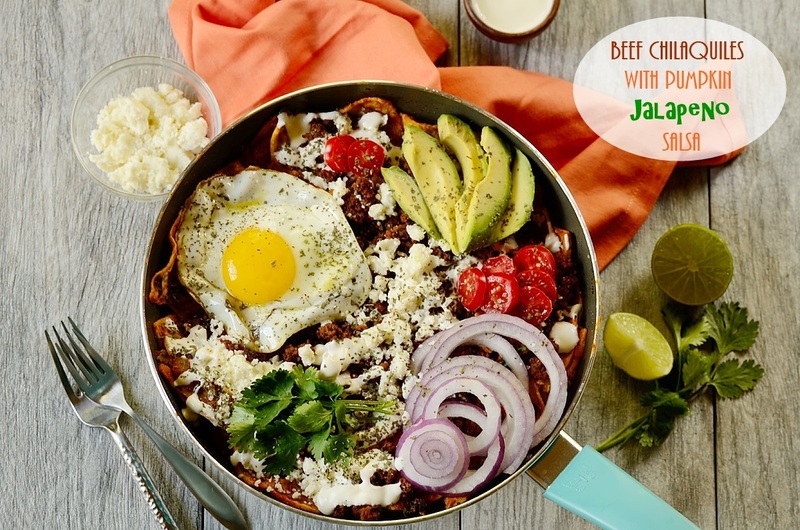 Ground Beef Chilaquiles with Pumpkin Jalapeno Salsa, a Mexican breakfast/brunch dish made with corn tortilla chips, a quick homemade salsa, beef, cheese, sour cream, fried eggs, and other fresh toppings. Disclosure: This is a compensated campaign in collaboration with Cacique Inc. and Society Culinaria. Thank you, friends, for supporting the brands that I work with and love! Have you ever heard about chilaquiles? 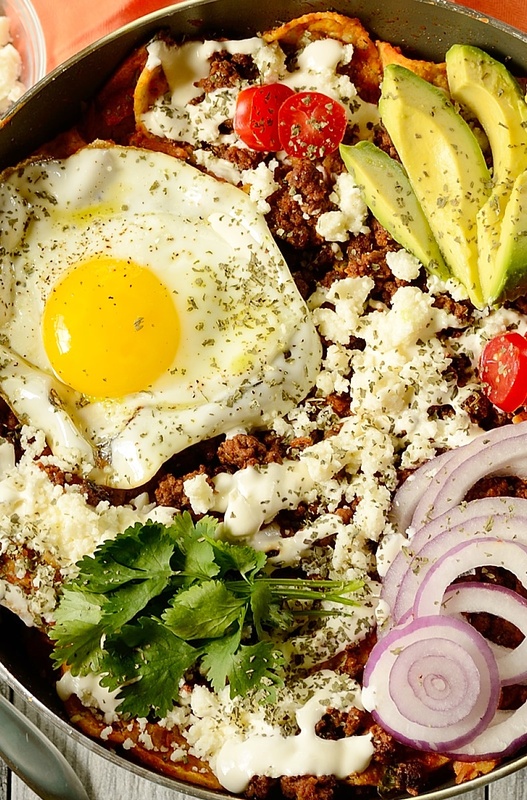 It is a Mexican breakfast/brunch dish made from fried tortilla chips, salsa, cheese, and other toppings, such as fried eggs. Well, today we made some to PER-FEC-TION! My, oh my! Our Ground Beef Chilaquiles with Pumpkin Jalapeno Salsa was a huuuuge hit with my family… and I am sure it will be with yours, too. Enchiladas? I say fuggedaboutit! The word of choice for today is CHILAQUILES! Chilaquiles is the plural for ‘chilaquil‘ which means “torn up old hat”. To make this dish, old tortillas and leftovers salsa (such as red salsa, green salsa, and moles/sauces) are used. There are regional and family variations of this satisfying Mexican dish. Although chilaquiles are usually served for breakfast or brunch, they can also be served as the last meal in a long wedding party close to morning (tornaboda). 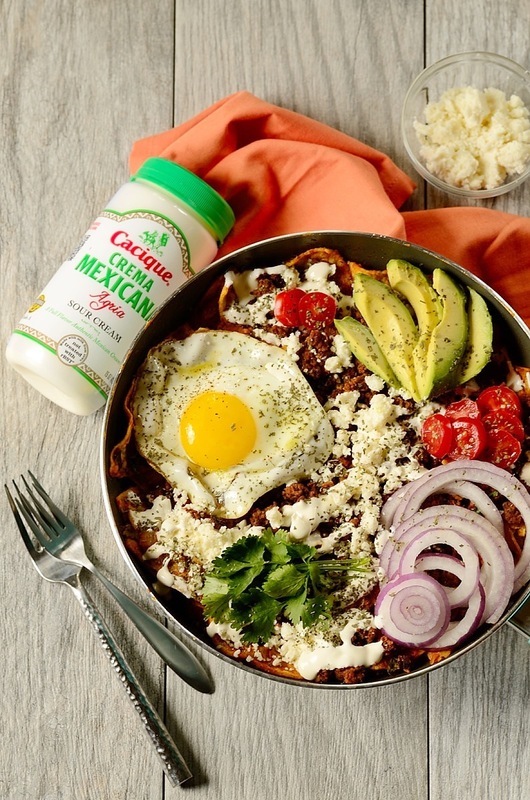 Our chilaquiles recipe was made with fried corn tortilla chips mixed with a quick pumpkin jalapeno salsa, topped with ground beef, Cacique Queso Fresco and Crema Mexicana Agria (sour cream), fried eggs, avocado, cilantro, grape tomatoes, and red onions. 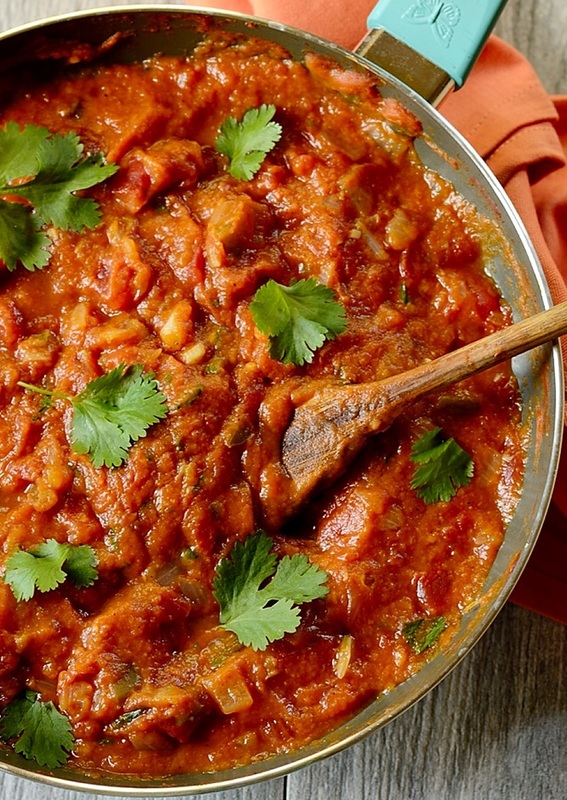 This is truly a dish to celebrate the joy of eating with fresh and bright flavors! 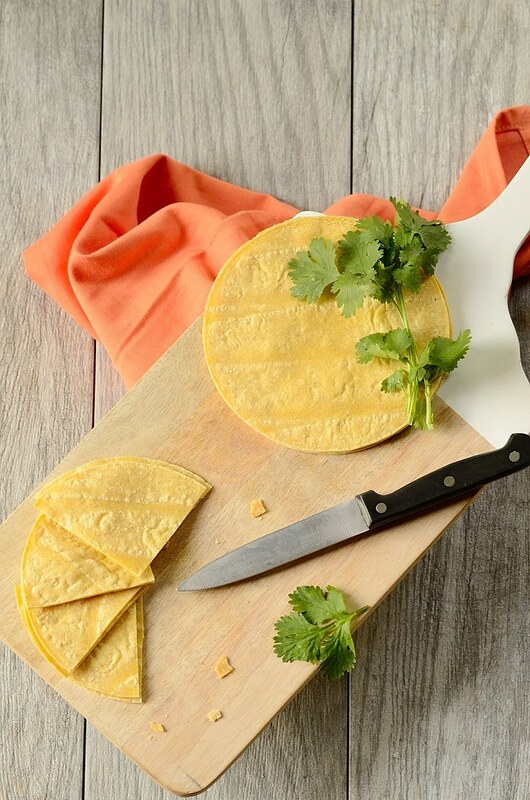 If you prefer not to let the corn tortillas dry on the counter for a few hours or overnight and then fry them in vegetable oil… well, then you can take the shortcut of buying tortilla chips right off of your supermarket shelf. Easy peasy! You can save time and avoid the mess. The quick pumpkin jalapeno salsa can be prepared ahead of time and used in more than one dish. It can even be served with corn tortilla chips as an appetizer for a party or Thanksgiving. 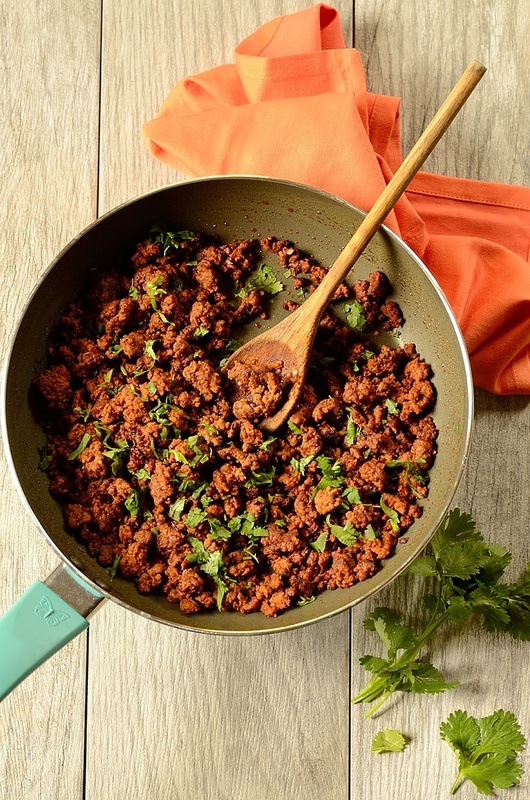 The ground beef was prepared within 10 minutes using taco seasoning, water, and red wine vinegar. Yes… it was as simple as that, and was delicious! The rest of the toppings can easily be purchased ready-made. 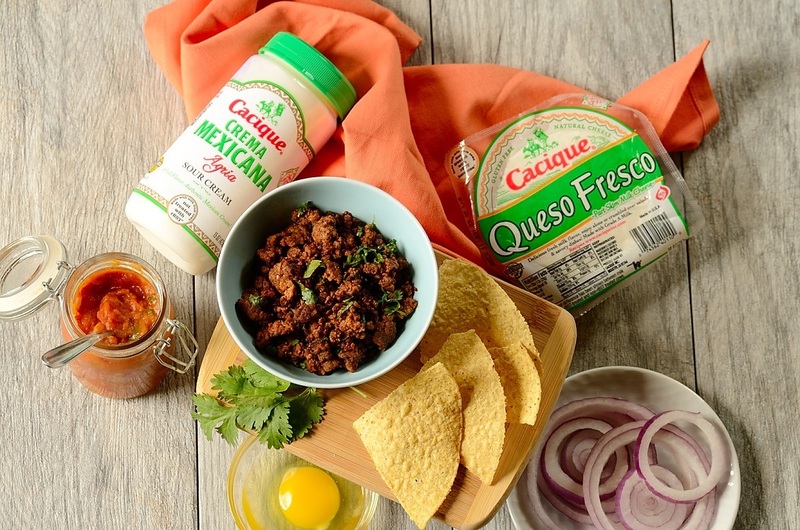 The Cacique Crema Mexicana Agria (a rich and creamy, non-gelatinous sour cream) and Queso Fresco are available at local supermarkets. To find out more about these and other Cacique products, and also to locate them at a store near you, just click here. My family had these beef chilaquiles with pumpkin jalapeno salsa for the first time and went totally bonkers for them… and me too! It was an excellent way to make good use of aged, drying-out tortillas, and to enjoy a superb, flavorful dish made with humble ingredients. Pumpkin, a seasonal ingredient, also shined bright in this dish, proving how useful it can be in more than just baked goodies alone. I hope that you try our chilaquiles… and if you’d still like to, you can save the ingredients to prepare enchiladas too. How versatile is that: same ingredients, two different dishes! 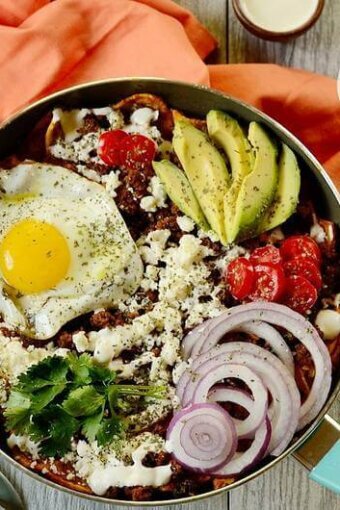 Ground Beef Chilaquiles with Pumpkin Jalapeno Salsa, a Mexican breakfast/brunch dish made with corn tortilla chips, a quick homemade salsa, beef, cheese, fried eggs, and other fresh toppings. New corn tortillas can be left to dry on the counter for a few hours or overnight. To prepare the tortilla chips, heat a 2-inch depth of vegetable oil in a heavy-bottom pan over medium-high heat. Fry the quartered tortillas in batches until they are light golden brown and crisp. Do not overcrowd the pan!!! Remove them with a slotted spoon and place on a large baking sheet lined with paper towel to absorb the excess oil. Set aside. If you would like to, you can use store-bought corn tortilla chips instead. Prepare the quick pumpkin jalapeno salsa according to the directions stated in the recipe. To prepare the ground beef, place thawed beef into a medium to large skillet and brown for about 5-6 minutes over medium-high heat. Drain the excess of fat. Stir in the taco seasoning and then water. Let cook for a couple of minutes and then add the vinegar, letting cooking for another 2 minutes. Set aside. To assemble the beef chilaquiles casserole, mix the tortilla chips with the warm/hot salsa in a skillet or baking dish, being careful to not break the chips apart. Top with the warm/hot ground beef and then drizzle on the warmed Crema Mexicana Agria. Top with crumbled Queso Fresco, fried eggs, sliced tomatoes, onions and avocados. Sprinkle with chopped cilantro and serve immediately while still warm/hot, with lime wedges if desired. Enjoy! It’s election day today, and I can think of no better recipe to offer comfort and nourishment. 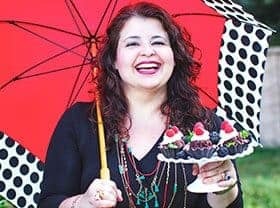 Wonderful recipe Denise! I agree with you, Deb! For a nerve wrecking day, comfort foods are the best! Oh wow Denise, this is my first time hearing about chilaquiles and it looks delicious! So much flavor! That was my first time making and eating them too, Shashi! It simply became one of my fave Mexican dishes. What a neat dish! I’ve had something similar, but not chilaquiles. But I will! This looks fantastic. Thanks! Yes yes yes!! I LOVE chilaquiles and this variation looks like the perfect comfort food right now–goodness knows we need it. Thank you for sharing this! That is a hearty breakfast, quite different from my usual smoothie or jam bread… 🙂 . I have never heard of chilaquiles, but it looks so good I am getting hungry again. This is really amazing! We’ll improvise with some of the ingredients, like using Greek yogurt in place of sour cream (not sold here) and queso fresco with Greek ricotta (anthotyros) and we bet it’ll taste delicious! Really exceptional work dear Denise, yummed!